This year marks the 50th Anniversary of the iconic Star Trek franchise, which was celebrated this weekend during a fan event on the Paramount Pictures lot, where the new trailer for Star Trek Beyond debuted. The event also featured a tribute to the late great Leonard Nimoy, where a street was named in his honor on the lot. Producer J.J. Abrams, director Justin Lin and cast members such as Chris Pine, Zachary Quinto and Karl Urban were also on hand for the event, where J.J. Abrams delivered some news that will make many fans happy. 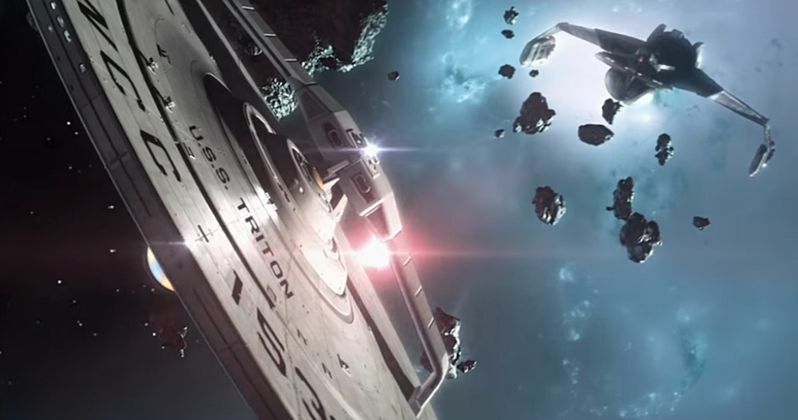 Back in late December, Paramount Pictures and CBS filed a lawsuit against the producers of the Star Trek fan film Axanar, which had raised over $638,000 through its Kickstarter campaign. The film had been set to start shooting late last year, with Kate Vernon, Richard Hatch, Gary Graham, J.G. Hertzler, Kim Fitzgerald and Alec Peters set to star. Robert Meyer Burnett is directing from a script by Bill Hunt, based on a story by Alex Peters, but the lawsuit threw the production into limbo, claiming the movie infringes on "innumerable copyrighted elements of Star Trek, including its settings, characters, species, and themes." During this fan event at the Paramount lot, J.J. Abrams revealed that, thanks to director Justin Lin, the lawsuit is being dropped by Paramount Pictures. Here's what the producer had to say during the fan event, courtesy of io9. "A few months back there was a fan film, Axanar, that was getting made and there was this lawsuit that happened between the studio and these fans and Justin, I'll tell the story because he probably wouldn't, was sort of outraged by this as a long time fan. We started talking about it and realized this was not an appropriate way to deal with the fans. The fans should be celebrating this thing. Fans of Star Trek are part of this world. So he went to the studio and pushed them to stop this lawsuit and now, within the next few weeks, it will be announced this is going away, and that fans would be able to continue working on their project." Axanar takes place 21 years before the events of "Where no Man Has Gone Before", the first Kirk episode of the original Star Trek. Axanar is the story of Garth of Izar, the legendary Starfleet captain who is Captain Kirk's hero. Kirk himself called Garth the model for all future Starfleet Officers. Garth charted more planets than any other Captain and was the hero of the Battle of Axanar, the story of which is required reading at the academy. This is that story. Here's what the Axanar producers had to say in a statement about the news. "While we're grateful to receive the public support of JJ Abrams and Justin Lin, as the lawsuit remains pending, we want to make sure we go through all the proper steps to make sure all matters are settled with CBS and Paramount. Our goal from the beginning of this legal matter has been to address the concerns of the plaintiffs in a way that still allows us to tell the story of Axanar and meets the expectations of the over 10,000 fans who financially supported our project. There is still a lot of work to do, but receiving this kind of public support helps immensely." Axanar tells the story of Garth and his crew during the Four Years War, the war with the Klingon Empire that almost tore the Federation apart. Garth's victory at Axanar solidified the Federation and allowed it to become the entity we know in Kirk's time. It is the year 2245 and the war with the Klingons ends here. The producers of Axanar also revealed that they didn't know that announcement would be made at the Star Trek Beyond fan event, but added they'd be working with their lawyers throughout the weekend, "proceeding with cautious optimism." We'll be sure to keep you posted with the latest updates on the Star Trek lawsuit over the fan film Axanar.